The title of this post and the line above come courtesy of a passage from a book called The Wisdom of Thomas Troward. If I’m being honest, this book is not where I first came across this bit of wisdom. In fact, I first heard it in a movie I saw a couple of years ago called, “You Can Heal Your Life.” For those familiar with those 5 words, yes, there’s a book by that name by Louise Hay. The movie is also by Louise Hay (about her life and her work). If you’ve never heard of Louise Hay, I’d encourage you to check her out — there’s a good chance you might find her work useful. Millions of other people have. Let’s get back to that quote, though. On its face, the quote might not make much sense, so I’ll put it in context. 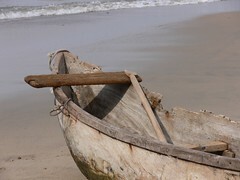 Before we used steel for boats, wood was the common element. Why was wood used? Well — quite simply — it didn’t sink. Let’s think about that for a moment. People used wood to make their boats because it wouldn’t sink — not because it floated — because it wouldn’t sink. That might seem like an inconsequential detail, but when the frame of the problem is “don’t sink,” it alters the number of solutions that are available. I should say, it alters the number of solutions that will be readily available to you. Why? Because we’re so focused on solving the problem of “don’t sink,” we might not see the solution that lies in the principles of flotation (see: displacement). And that’s just it, until someone took a step back and looked at the problem from the perspective of flotation, discovering the principles of displacement was never going to be possible. So — what is it in your life that you’re so focused on that won’t let you see the forest for the trees? Or, in what ways are you trying not to sink when you should be focused on how to float?